illustrations and extended resources, this book provides essential wisdom for cooks, homesteaders, farmers, gleaners, foragers, and food lovers of any kind who want to develop a deeper understanding and appreciation for arguably the oldest form of food preservation, and part of the roots of culture itself. 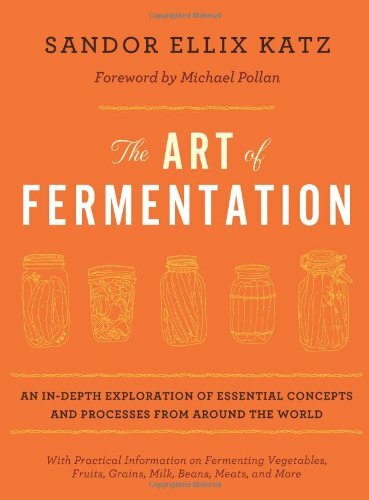 Readers will find detailed information on fermenting vegetables; sugars into alcohol (meads, wines, and ciders); sour tonic beverages; milk; grains and starchy tubers; beers (and other grain-based alcoholic beverages); beans; seeds; nuts; fish; meat; and eggs, as well as growing mold cultures, using fermentation in agriculture, art, and energy production, and considerations for commercial enterprises. Sandor Katz has introduced what will undoubtedly remain a classic in food literature, and is the first-and only-of its kind. Author of Wild Fermentation (book version, 9781931498234) and The Revolution Will Not Be Microwaved (9781933392110), both published by Chelsea Green. Michael Pollan is a contributing writer for "The New York Times Magazine" as well as a contributing editor at "Harper's" magazine. He is the author of two prizewinning books: "Second Nature: A Gardener's Education" & "A Place of My Own: The Education of an Amateur Builder". Pollan lives in Connecticut with his wife & son. Which Vegetables Can Be Fermented?